To keep your broccoli as fresh as possible, store it in optimal conditions, taking into consideration temperature, humidity levels and ethylene gas. All four of these concerns affect how long your fresh broccoli will last. 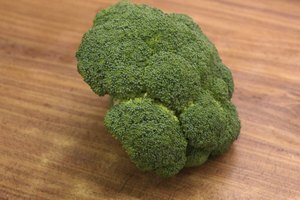 Fresh broccoli can also be blanched and frozen if you're unable to use it in time. Broccoli enjoys very cool storage temperatures, as it's a cold weather crop. Store broccoli as close to 32 degrees Fahrenheit as possible without actually freezing the vegetable. At this temperature, given ideal airflow and humidity, broccoli lasts upwards of 21 to 28 days. The warmer the storage temperature, the shorter the shelf life. 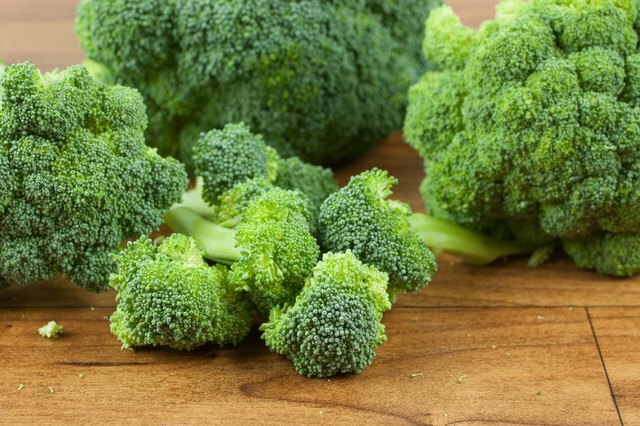 By the time storage temperatures reach 50 F, broccoli can last no more than 5 days. Because it enjoys cool temperatures, you can place ice directly onto broccoli heads to keep them cool. Broccoli is best stored in high humidity, so keep it in the produce drawer in your fridge, set to as much humidity as possible; broccoli prefers conditions of 95 to 100 percent humidity. 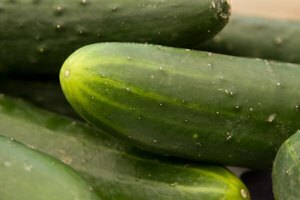 If your fridge's produce drawer doesn't have humidity controls, wrap fresh broccoli in plastic wrap or a plastic bag and keep it in the fridge. 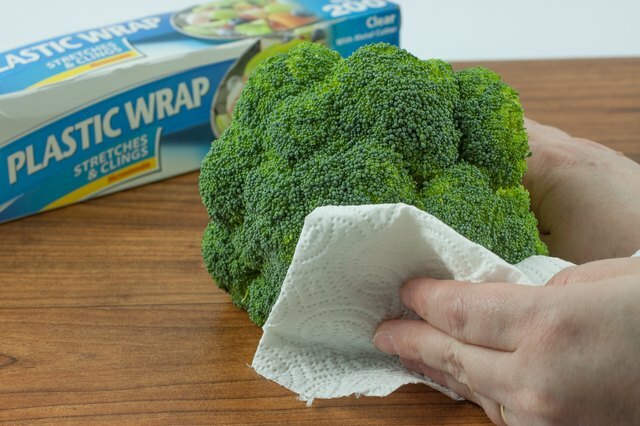 To prevent decay, don't wash broccoli before storage, and pat it dry before wrapping, removing excess moisture. Because of its humidity preferences, broccoli is best stored with other cool-temperature vegetables that enjoy high humidity levels. 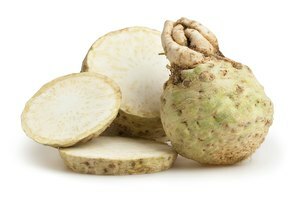 Vegetables that prefer similar storage conditions include artichokes, asparagus, leafy greens such as lettuce, mushrooms, radishes and peas. 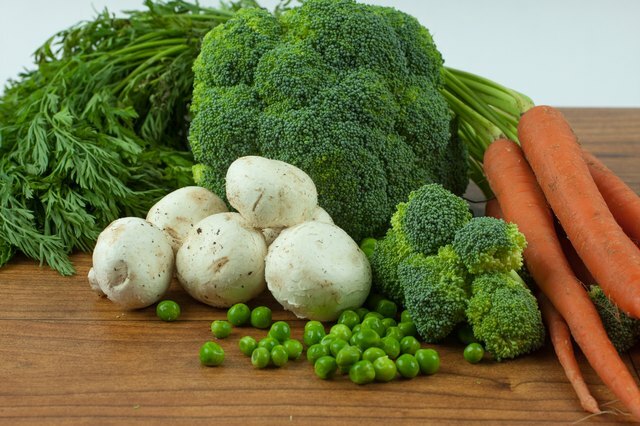 Like these other vegetables, broccoli is very sensitive to ethylene gas, which is produced by fruits as they ripen. Because of this, never store broccoli next to fruit or melons. 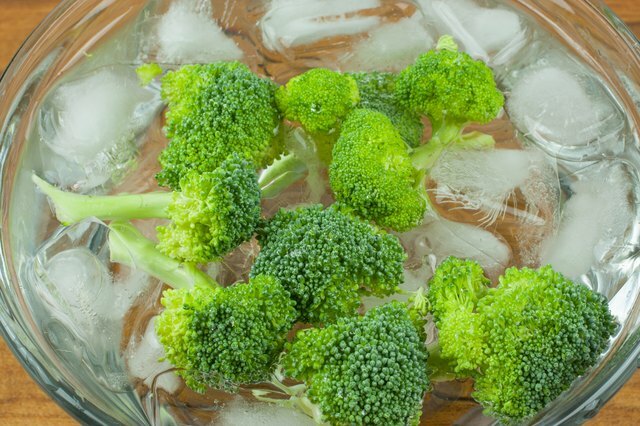 If you can’t use broccoli before it begins to yellow and soften, freezing it can prevent broccoli from going to waste. Blanch broccoli after cleaning it by exposing the cut florets to steam from boiling water -- use a steamer basket and a large pot -- for 3 to 5 minutes. 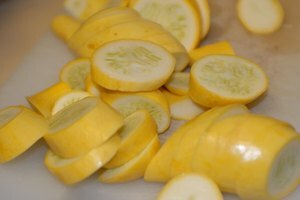 Plunge the blanched florets into ice water to stop the cooking process, and then store them in airtight containers or freezer bags. Frozen broccoli won't retain the crispness of fresh broccoli, but can be used for soups and sauces. Frozen broccoli can keep, stored correctly for upwards of 3 months.